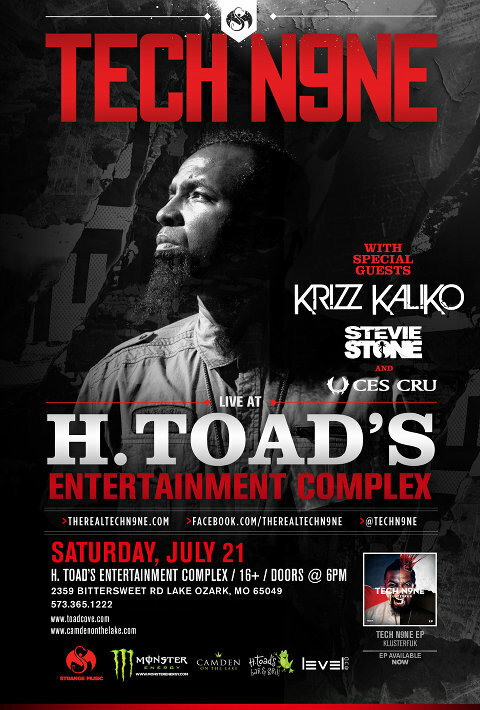 This Saturday, July 21, grab your sunscreen and check out Tech N9ne at the Lake Of The Ozarks as he wrecks shop at H. Toad’s Entertainment Complex. With special guests Krizz Kaliko, Stevie Stone and CES Cru, Tech N9ne will turn one of the go-to getaway spots in the midwest into the center of the livest show in hip hop. Come by car or by boat to what will undoubtedly be one of the hottest nights of the summer!